I Found This Useful: How fast is AES-NI on a Mac? How fast is AES-NI on a Mac? Previously I looked at the then new Apple Mac laptops with Core i CPUs and their AES-NI hardware extensions. Since then I've learnt that the openssl shipping with Mac OSX Lion has not been compiled with AES-NI support. Here's an easy way to tell. From the command line run "openssl engine"
See the line "(aesni) Intel AES-NI engine"? if its not there, then its not happening. And thats how I know openssl on Mac OSX Lion 10.7.4 doesn't have it. So how to benchmark? 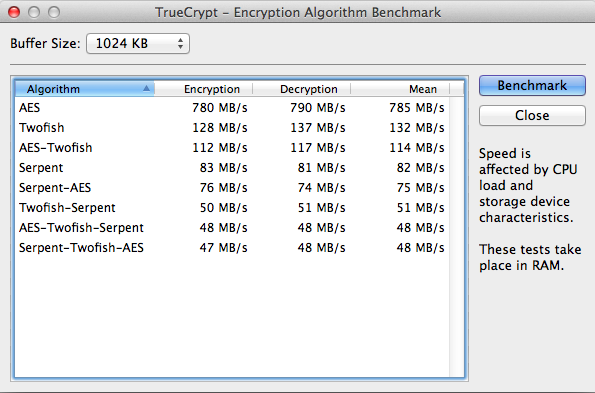 Turns out that Truecrypt has a benchmarking engine. 1. Launch Truecrypt and click "Create Volume"
2. Then click "create an encrypted file container"
5. When this screen loads, select a buffer size and press Benchmark. Try not to have any other processes eg browsers running since this will skew the results. As you'd expect, huge difference!